Discomforting is a difficulty level card. It first appeared in The Black Goat of the Woods expansion. Setup: During step 2 of the game setup, place an additional Clue token on each unstable location on the game board. 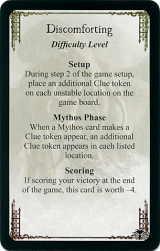 Mythos phase: When a Mythos card makes a Clue token appear, an additional Clue token appears in each listed location. Scoring: If scoring your victory at the end of the game, this card is worth -4. This page was last modified on 23 June 2009, at 06:46.